In 2011, the Agricultural Research Division of the United States’ Agency for International Development (USAID) solicited brief proposals from the International Institute for Tropical Agriculture (IITA) and the International Livestock Research Institute (ILRI). These proposals were on how to improve smallholder farm productivity, enhance food and nutritional security, increase incomes and ensure good natural resource management. Across the agro-ecologies of West Africa, Ethiopian Highlands and East and Southern Africa, it was clear that Africa RISING (Research In Sustainable Intensification for the Next Generation) was set to do anything but ‘business as usual’. Over the last six years of operation the program has developed and tested some proven agricultural innovations that could potentially bring millions of households out of poverty while at the same time protecting the environment for the future. Initiatives such as this one are much needed for the achievement of the growth and transformation ambitions of the African Union’s Malabo declaration and 2063 Agenda. 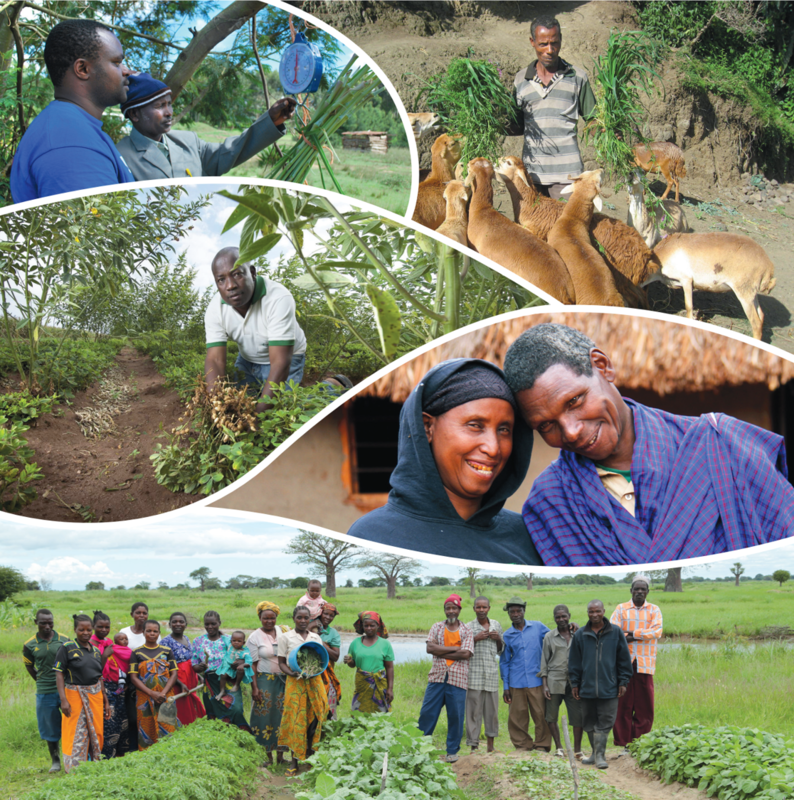 Throughout the five+ years of the program’s first phase (2011–2016), interdisciplinary teams of over 100 scientists from 11 CGIAR centers and 39 National Agricultural Research Systems (NARS) undertook pilot projects, early win projects, mother-and-baby trials, innovation platforms, comprehensive monitoring and evaluation efforts led by the International Food Policy Research Institute (IFPRI), and a host of other initiatives, to unpack sustainable intensification research and offer an inspiring body of work behind. What I am proudest of? The establishment of the ‘community-based farmers’/women’s interest groups’. As well as the conceptualization and implementation of the ‘community-based technology park’ concept in West Africa (Ghana and Mali) for testing, demonstration and dissemination of technologies; knowledge exchange between farmers, researchers, extension officers, and students; and hands-on training of farmers. 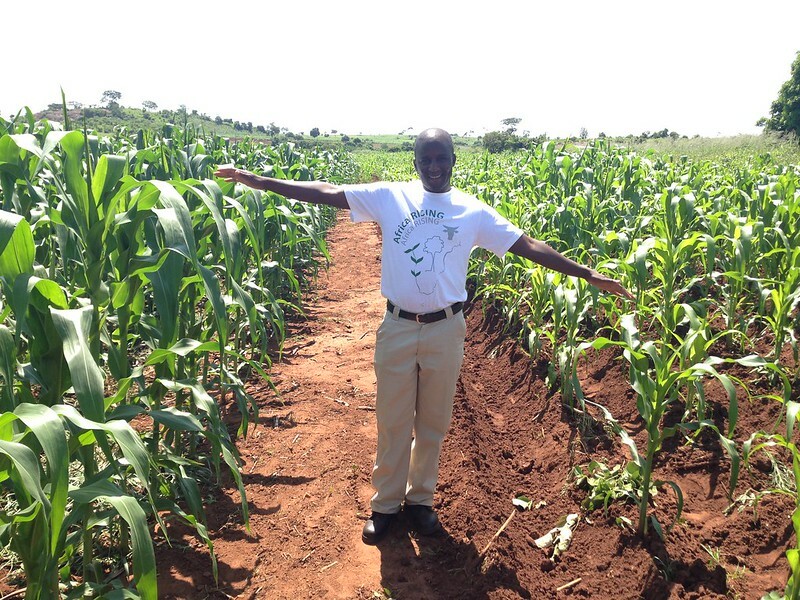 Mulundu Mwila (ZARI) standing in front of Gertrude Banda’s trial and showing the performance of conservation agriculture and conventional ridge tillage (photo credit: CIMMYT / Christian Thierfelder). This body of work, which is directly informing the second phase of the program (2016–2020), is now summarized in the publication ‘Footprints of Africa RISING—Phase I (2011-2016)’. Deploying improved varieties such as high-yielding wheat, quality protein maize, vegetables etc. Manipulating crop ecologies to get more from limited land through e.g. intercropping and smart weed management. Applying integrated fertility management with e.g. mineral fertilizers. Enhancing livestock production by among others methods managing dry-season feed gaps or building simple but effective crop residue storage sheds. Improving food safety and reducing waste e.g. through use of sealed storage bags, tackling aflatoxins etc. Reducing soil loss and enhancing water utilization with e.g. conservation agriculture and landscape restoration. Developing decision-support tools such as precision scaling, innovative typology studies etc. In addition, Africa RISING also developed an entirely novel ‘sustainable intensification assessment framework’ together with the Feed the Future Innovation Lab for Sustainable Intensification (SIIL), USAID, Michigan State University (MSU), University of Florida (UF) and Kansas State University (KSU). This framework considers five domains of sustainability (economic, environmental, human, social and productivity) across three scales (field/animal herd scale, farm/household scale, landscape scale). There is learning and reflection as Africa RISING progresses along the research to impact pathway. Because of this experience, the program is beginning to set standards that might guide other similar projects. One good example is quantifiably defining what sustainable intensification is, which will better guide our activities in Phase II. Mateete Bekunda, chief scientist, Africa RISING–East and Southern Africa. Among its staff and partners the program also had a strong collaborative approach supported by program and regional project-level communication work that was acclaimed by USAID. This was seen in an important and consistent effort to develop graduate and post-graduate capacities; increasingly important gender considerations and an unmatched partnership approach that is paving the way for scaling up in the second phase. Africa RISING field day in Basona Worena November 2015 (photo credit: ILRI/Apollo Habtamu). Africa RISING introduced various interventions and validated the workability and acceptance by smallholder farmers. Some farmers have adopted one and others from two to eight interventions. The innovations have benefited farmers in terms of filling yield gaps, improving nutrition and diversifying income sources. All in all, the program left an important footprint in the landscape of sustainable intensification research, and the second phase of the program is poised to take to heart the many lessons from the first 2,000 days of Africa RISING, and build on its energy. Five years later, the risk has paid oﬀ. 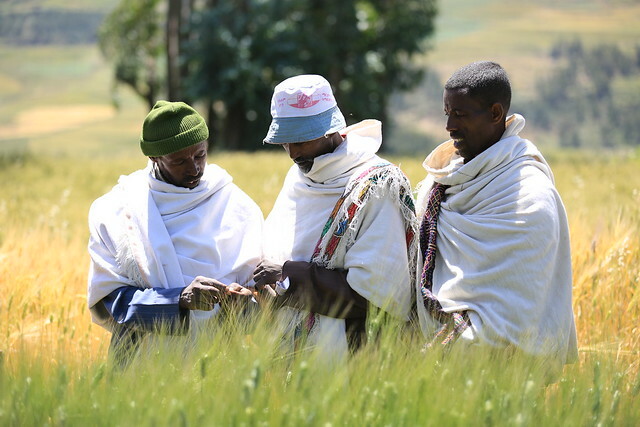 Many plausible options developed across the program have proven viable, from high-value fruits and vegetables, improved livestock, feed and forage management, and improved crop varieties and agronomic practices, through to farm- and landscape-scale natural resource management practices. Tens of thousands of farmers across the continent have a much expanded ability to make decisions that will launch them on their chosen pathways out of poverty and food and nutrition insecurity, while allowing them to protect the natural resources essential for the next generation of farmers. This is Africa RISING. 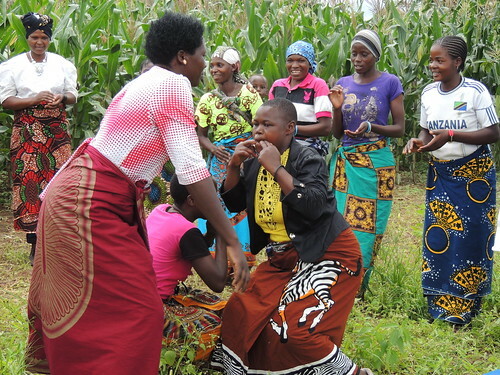 A group of farmers in Iwalanje Village in Mbeya, Tanzania dance during Africa RISING management team monitoring visit (photo credit: IITA/Gloriana Ndibalema). Tags: CGIAR, farming systems, Synthesis, USAID. Bookmark the permalink.